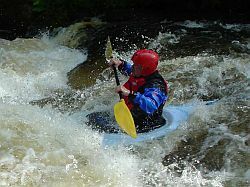 Also known as Moving Water, water that flows in our rivers gives the advantage of stunning scenery and exhilaration. For us in Paignton we have a number of rivers accessible within a short distance, such as Rivers Dart, Teign, Exe, and Barle. These have different sections that have a level suitable for a beginner to complete adrenalin junky. 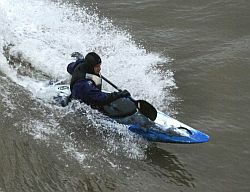 Paddling on moving water requires a certain skill level and ability to control a boat. The general starting skill base for moving water is that equivalent to BCU 2star or the club Improvers course. 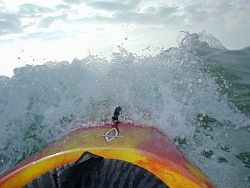 Once these skills have been obtained and honed in a practical situation, (usually over a summer season) then moving water can be the next stage in your paddling progression. In today’s technological world any information can be found on the Internet. 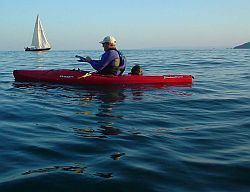 However to make things simpler below are a number of links that point paddlers in the right direction. If you want more information, then feel free to ask a coach or committee member.